14. The Tavern "Zum Bären"
16. The tavern "Zum Schwan"
End of the 19th century, the arms and ammunition factory, a subsidiary of Deutsche metal cartridge factory, here in Won Speitel moved on. For the safety of the population Iediglich allowed the quantity of two rail cars are stored with cartridges at the factory. After a brief closure in 1918 they built up to the second world war, the operation continues, until the work was, however, almost entirely destroyed in an air raid on 24 April 1944. 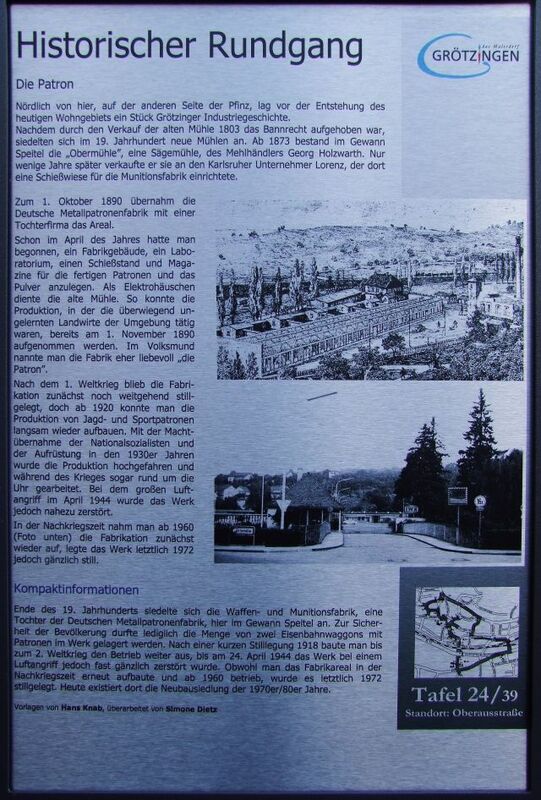 Although we built the factory area in the post-war tent again and operational since 1960, it was stlllgegelegt Ietztlich 1972. Today there exists the housing development of the 1970s / 80s.